Let me tell ya–I didn’t need caffeine to start my day yesterday. Nuttin’s better’n full-rush adrenaline! 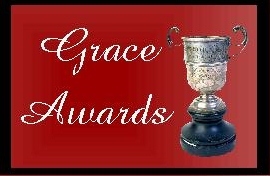 The Grace Award is reader based. Readers nominate novels for final judges to read and choose from. For Give the Lady a Ride to have been nominated for the Romance/Historical Romance genre out of all the wonderful romances out there was an amazing feat, but to have won? Yowzah! I beyond honored! Thank you to all who nominated it, and thanks to the judges, Jessica Patch, Janalyn Voight, and Rachel Wilder, for deeming it worthy of the award! This entry was posted in Personal and tagged Christian Fiction, Christian romance, Contemporary Christian Romance, contemporary romance, Contemporary Western Romance, Give the Lady a Ride, Grace Award, Janalyn Voight, Jessica Patch, Rachel Wilder, western romance. Bookmark the permalink. 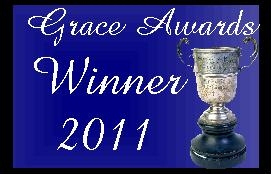 17 Responses to 2011 Grace Award Winner! hehe – you’re allowed a bit of wordiness when you’re OVER THE TOP EXCITED 😉 Totally tickled by this. Congratulations!!! It is an honor to hear your thoughts and learn and share with you in the writing groups that we both are a part of. I wish you the very best. Your news makes me very happy. I enjoy our group, too. Love to discuss writing with other writers! I just submitted this to Stumble Upon. Yay, Linda! I think the best part is that you were nominated by readers! That’s really who we’re writing for! That does make it special. Humbles me to think of it! Giggle! Well, he doesn’t, but I think Mom does. Truth is, I definitely am elated enough to float at least as far as my tether! Congrats again! I’m still grinning at random moments during the day just thinking about this! Just the great-biggest congratulations ever to you! You put your heart into that book, didn’t give up on finding an agent, and now you can enjoy all the kudos.